From Hackney to Chelsea in the company of the great 1920s British travelogue. Across two series and over 20 films, the directors of Wonderful London captured some of the most evocative images of the capital in the mid-1920s. These simple films contrasted different aspects of city life – East End and West End, poor and rich, natives and immigrants – often looking beyond the stereotypes to show surprising views of the city. As well as familiar landmarks of London town – the Thames, Big Ben, Tower Bridge and St Paul's – Wonderful London reveals its less well illustrated quarters; the over-populated districts of Clerkenwell, London's original Chinatown or the South Asian and African seaman who worked in the Port of London. We can wander past the long vanished Crystal Palace and the recently vanished gates of the White City and London's first Olympic stadium now lying under the new Westfield Shopping Centre. We can take a trip on a barge from Limehouse to Paddington Basin, via King's Cross and the Zoo and peer into everybody's back gardens. We can check out the street markets on a Sunday and wander down crazy little alleys, past pot-bellied pubs, inns of court and the buildings that Dickens knew. 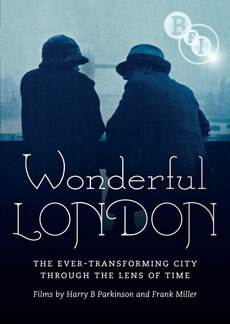 And we can see generations of Londoners – all now gone but strangely still like the Londoner of today. This fascinating collection includes six new restorations by the BFI National Archive – Barging Through London, Cosmopolitan London, London's Sunday, Flowers of London, London's Free Shows, London off the Track – all of which reintroduce the films' original tinting and toning. Newly restored by the BFI National Archive. Six additional Wonderful London films: Dickens' London / London's Outer Ring/ London Old and New/ London's Contrasts/ Known London/ Along Father Thames to Shepperton. Newly recorded piano accompaniments by John Sweeney.